Are some of your plates and bowls still dirty when they emerge from the dishwasher? The problem might be how you're loading the machine. Read on to learn the right way. Of all kitchen appliances, the dishwasher must rank as one of the greatest, don’t you think? It’s a true time-saver. While the alternative involves laborious scrubbing, this wonderful convenience of modern life takes just the push of a button to restore a glut of dirty dishes to pristine cleanliness. The trouble is that on occasion you may open the post-cycle dishwasher to find that some items are less clean than you’d like. In such cases, it may be that the appliance isn’t to blame; perhaps you, its user, are the culpable one. Most of us are accustomed to packing in as many cups and plates as possible, but did you know there is a right way to load a dishwasher? Read on to learn how to fill the machine to the brim without sacrificing cleaning effectiveness. Proper use of the dishwasher begins with knowing which items are safe to put in the machine. While it certainly seems that more and more items these days are dishwasher-friendly, there remain some materials that you ought to hand-wash in the sink—namely, wood, cast iron, bronze, pewter, and leaded crystal. 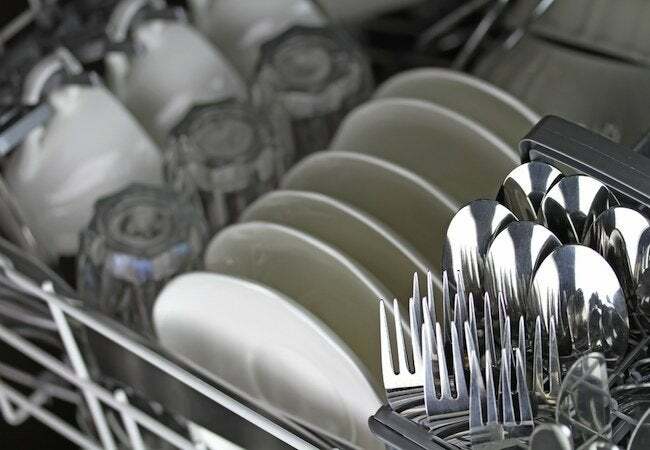 Silver can go in the dishwasher only in certain cases; if you’re not sure about yours, it’s best to be cautious and hand-wash.
Before putting any plates or bowls, pots or pans into the dishwasher, be sure to scrape food residue into the trash. 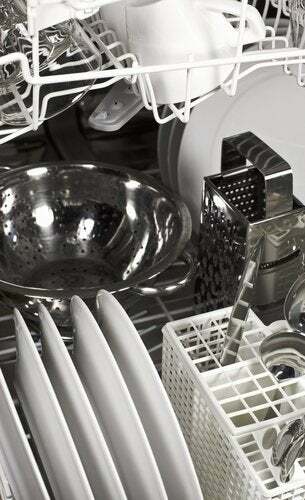 With modern dishwashers, running dishes under the faucet isn’t typically necessary. But if your machine is older and tends to struggle, prerinsing can be a good idea. Don’t go overboard, though; dishwasher detergent actually needs some grime to stick to. If you use your dishwasher to clean large, unwieldy items like baking pans and cookie sheets, position them along the perimeter of the lower tier. Safely confined to the sides of the machine, the pans and sheets are less likely to impede the sprays that come from the bottom of the appliance. Load plates and bowls—plus any dishwasher-safe pots and pans—in the lower rack. Staggering larger and smaller plates can help them all get cleaner. Bowls may be placed side by side but tilt each one so that its dirty portion faces down. If your dishwasher comes with baskets for flatware, take advantage. It’s a good idea, however, to point some pieces of flatware up and others down. Also, mix forks, knives, and spoons together in the same baskets rather than grouping like items. Mixing things up prevents a nesting effect that limits exposure to the spray. Place larger plastic containers on the lower shelf and smaller ones on top. All should face downward. Unlike dishes, plasticware should be lodged firmly between dividers so that containers do not become dislodged in the course of the cycle and interfere with the machine. On the top rack, lay long utensils (for example, spatulas) perpendicular to the wire supports of the rack (if laid parallel, such items might fall through and block the spray arm). Next, place glasses and mugs along the left and right sides of the upper rack—and if your machine has one, snap down the protective flap. Finally, rest bowls over the long utensils you already placed. Yes, over the utensils—although it’s usually best not to layer items in the dishwasher, you can get away with it here, because cooking utensils are normally thin and not likely to block the spray of water. The choice of detergent—liquid or powder—is largely a matter of preference, but for maximum effectiveness, use detergent that’s no more than two months old. Once you’ve got the machine running, go ahead and dirty another bowl with something—ice cream, anyone?—to celebrate the fact that you’re now a pro when it comes to loading a dishwasher properly.